Coming Soon! Stay tuned as we build this masterpiece. Ballistic Cycles has always been a trendsetter in the industry. The crew at Ballistic Cycles was the first to add a 30” wheel to a motorcycle. 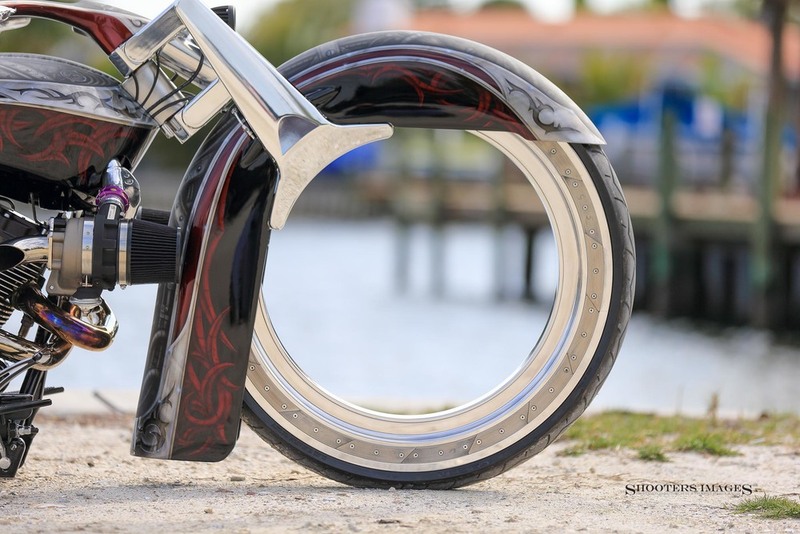 Then, they took the big wheel concept a whole another step forward and added a big hubless front wheel to a motorcycle. Cutting necks and adding a few glass parts is one thing, but truly building a ground-breaking motorcycle takes a bit more time, effort, and a planning. The entire front end is completely one off and each and every part is custom for this feature. The hubless wheel is machined from a solid piece of billet, and the brake system is integrated into the wheel. The custom air cylinder is designed specifically for the load endured by the wheel and motorcycle. The mechanics behind the hubless wheel features all the latest technology and completely pushes the boundaries of what is possible.